Gustavo Aguilar Get Libre Collective - "Destinations"
Gustavo Aguilar is a California based percussionist (credited with "sobor" drum kit) who has performed all over the globe with the likes of Anthony Braxton, Nels Cline, Charlie Haden and many others. On Destinations he is joined by Todd Sickafoose on bass, Eric Crystal on saxophones, flax (not sure what that is) and melodica, Chris Garcia on udu and tabla and Robert Reigle on tenor saxophone. The Collective grabbed me right away with the opening track, "Different Paths, Same Destinations". A steady seductive sax melody leads the way, backed by busy varied percussion and thudding bass notes. The contrast between the almost lounge styled saxophone and energetic percussion works a charm, with the cool horn melody offsetting, but working cooperatively with the percussion. "Legends" begins as a much more sparse piece with a whining and droning chamber ensemble feel. But after a few minutes it transitions to a cool jazz groove with low key but passionately expressive playing. The pace gradually picks up to the point where we experience a gorgeous frenzied sax duel and intense performances from all. "Concepts In Travel Comfort" is a percussion fest with warbling sax and droning bass acting as a background guiding light, and the second sax creating the melody. It's got a great jazzy tribal feel and I sensed the spirit of Sun Ra looming overhead. And, like "Legends", it builds in pace and intensity as the piece develops, creating a wonderful mixture of cool jazz and avant-garde elements to create powerfully compelling music. There are a handful of shorter tracks on the album, "Along The Red Lines" being an excellent example of controlled chaos with a determined narrative flow. But the others come across mostly as bits of what should be larger works, the music screaming out for further development. Overall an excellent set of exciting improvisational jazz with much to challenge the adventurous listener, but never straying far from accessible sounds and styles. For more information you can visit the Gustavo Aguilar web site at: http://www.gustavoaguilar.com. 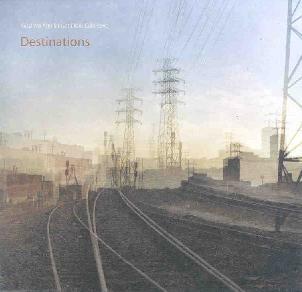 Destinations is distributed by Circumvention Music. You can visit their web site at: http://www.circumventionmusic.com. Contact via snail mail c/o Cirumvention Music; PO Box 948609; La Jolla, CA 92037.